IN the Introduction, I have shewn that the brain is admitted by physiologists in general to be the organ of the mind ; but that two obstacles have impeded the discovery of the uses of its particular parts. In the first place, dissection alone does not reveal the vital functions of any organ : no person, by dissecting the optic nerve, could find out that its office is to minister to vision; or, by dissecting the tongue, could ascertain that it is the organ of taste. Anatomists, therefore, could not, by the mere practice of their art, discover the functions of the different portions of the brain. Secondly, the mind is unconscious of acting by means of organs ; and hence, the material instruments by means of which, in this life, it performs its operations and communicates with the external world, cannot be discovered by reflection on consciousness. mical and metaphysical modes of research, and is conformable to the principles of the inductive philosophy. No inquiry is instituted into the substance or essence of the mind, or into the question, Whether does the mind fashion the organs, or do the organs determine the constitution of the mind ? If dissection of organs does not reveal their functions, and if reflection on consciousness fails to disclose the nature of the mind's connection with matter, no means remain of arriving at philosophical conclusions on these points ;" and speculative reasoning concerning them, although it may amuse the fancy, cannot instruct the understanding. Mr Stewart justly observes, that " the metaphysical opinions -which we may happen to have formed concerning the nature either of body or of mind, and the efficient causes by which their phenomena are produced, have no necessary connection with our inquiries concerning the laws according to which the phenomena take place. . Whether, for example, the cause of gravitation be material or immaterial, is a point about which two Newtonians may differ, while they agree perfectly in their physical opinions. It is sufficient if both admit the general fact, that bodies tend to approach- each other, with a force varying with their mutual distance, according to a certain law. In like manner, in the study of the human mind, the conclusions to which we are led by a careful examination of the phenomena it exhibits, have no necessary connection with our opinions concerning its nature and essence" l The object of Phrenology is to discover the faculties of the human mind, the organs by means of which they are manifested, and the influence of the organs on the manifestations. It does not enable us to predict actions. 1 Elements, vol. i. Introduction. probable to justify an inquiry into the direct evidence by which it is supported. Before entering on this subject, however, I may remark that physiologists have a great aversion to Dr Gall's method of investigation, because they conceive it to be particularly liable to error. There is the want, they say, of that precision which is so desirable in science. There is no measure of the size of an organ. It cannot be estimated in inches, nor by weight. Again, there is no standard by which to try the force of the manifestations. They therefore reject the whole method as empirical and unphilosophical, and incapable of leading to scientific truth. We at once admit that the two elements in our method of investigation are both in their own nature estimative. We cannot accurately measure the size of particular parts of the brain during life ; but we affirm, that if an observer possess an average natural endowment of the observing faculties, he may, by due practice, learn to estimate it with sufficient precision to lead him to positive conclusions. Again, we confess that we cannot measure the force of each manifestation of the faculties by ounces or inches, but we maintain, that, by proper instruction and the exercise of the understanding, we may estimate it also. Phrenology, in its evidence, rests on the same foundation as the practice of medicine. The existence of disease cannot in general be determined by weight or measure, and the characters of diseases can be judged of only by their appearances, or the symptoms which they present. The organs affected,-the degree to which they are affected,-and the extent to which medicines act on them, are all estimated by the exercise of observation and reflection on mere symptoms. In the practice of medicine-anatomy, physiology, and pathology, shed their lights to help the judgment in its estimates, but they do not reveal the theory of medicine à priori, nor do they render it a demonstrative science. tions are not ponderable or measurable, any more than the capacity for pain or pleasure, or the powers of hearing or sight, are so. We estimate the degree in which these susceptibilities and capacities arc possessed by different individuals, and regard our knowledge as substantial ; and we must of necessity learn to estimate the force of the mental manifestations by a similar exercise of observation and reflection, or remain for ever ignorant of mental science. Again, the differences between the forms of particular organs, and between their sizes when large and small, are so palpable that it is absurd to deny the possibility of distinguishing them in favourable cases ; and, in proving a science, we are not only entitled, but bound by the dictates of common sense, to select the simplest and the most striking cases, the instantia ostentiva of Bacon, as best calculated to bring the truth to light. It must therefore be by the exercise of observation and reflection, or by the practice of the method of estimating, that we shall discover the primitive faculties connected with particular parts of the brain, if we shall ever discover them ; and it will be only after these discoveries shall have been made, that anatomy, physiology, and pathology, will shed light on our path. Until we have followed this method, they are as little adapted by their own beams to reveal the functions of the different parts of the brain, as they are to unfold à priori the symptoms and best modes of treatment of diseases. the propositions which they announce were first ascertained, and may still be traced. They assume that the inquirer has qualified himself, by previous study, for understanding and appreciating what they describe, and they refer him to the sick-beds of the people for verification of their remarks. We teach our student how to observe, and refer him to the active theatre of the world, where he will find faculties manifested, and developments of organs exhibited, to an unlimited extent, and we bid him verify our observations there. We refer him to prisons and lunatic asylums, and to pathological cases reported by phrenologists, for evidence of excessive, of deficient, and of diseased, manifestations. The opponents, however, object to pathological cases reported by phrenologists, because, they say, they are interested in representing them in favour of their own views. might be ; and equally valueless and inconclusive will similar reports relative to the brain in all probability appear, when made by those who are ignorant of the uses of its different parts. 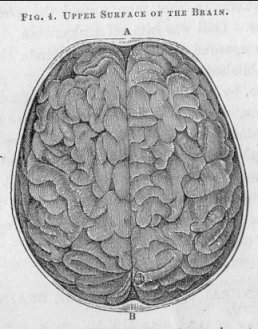 I therefore respectfully maintain, not only that the principles of investigation adopted by phrenologists are sound, and adequate to attain the ends in view in employing them ; but that there is no other method by which the primitive faculties attached to particular portions of the brain can be discovered. For the purpose of comparing mental faculties with cerebral development, then, it is necessary to shew, 1st, that the mental qualities of individuals can be discovered ; and, 2dly, that the size of different parts of the brain can be estimated during life. whole. Hence, in addressing any individual, they have been in the custom of modifying their conduct according to their previous knowledge of his dispositions or temper, obtained by observing his actions. To the covetous man they address one motive ; to the benevolent another ; to the proud a third ; and to the vain a fourth. When they wish to move such individuals to act, they speak to the first, of his personal interest ; to the second, of the pleasure of doing good ; to the third, of the necessity of preserving his own dignity ; and" to the fourth, of the great praise that will attend the performance of the action recommended. quired by habits of study or of business." l They do not place in difficult situations, requiring great penetration and much sagacity, individuals who cannot trace consequences beyond the stretch of three ideas ; nor do they conceive that a man who has no intellectual capacity to-day, may become a genius to-morrow, or ten years hence, by an effort of the will. They, no doubt, have observed, that the faculties are developed in succession ; that the child is not in possession of the powers of the full-grown man ; and that hence a boy may be dull at ten, who may turn out a genius at twenty years of age, when his powers are fully unfolded by time. But they do not imagine that every boy may be made a genius by " habits of study or of business ;" nor do they believe, that, after the faculties are fully developed, any individual may, if he chooses, become great in a department of philosophy or science for which he had previously no natural capacity. They have observed that cultivation strengthens powers in themselves vigorous ; but they have not found that education can render eminently energetic, dispositions or capacities which Nature has created feeble. They would laugh at any one who should attempt to convert an idiot into a profound philosopher. On the other hand, they have remarked, that, where Nature has bestowed a powerful disposition or capacity of a particular kind, it holds the predominant sway in the character during life, notwithstanding every effort to eradicate or subdue it. They have noticed, too, that where Nature has conferred, in an eminent degree, the faculties which constitute genius, the individual manifests his native superiority in spite of great obstacles arising from circumstances or situation. The lives of poets, painters, and artists, in every age, bear witness to the truth of this observation. An individual, it is true, may do particular actions, or even for a time follow lines of conduct, the same in exter-1 Dugald Stewart. 106	ON THE PRINCIPLES OP THE SYSTEM. nal appearance, from, different internal motives. But few men can pass their whole lives in disguise, or acquire the art of acting in the business and enjoyments of life, so habitually and so skilfully, as not to allow their true characters to appear to those who are placed in a favourable situation for observing them : or, if there be persons who do possess this power of dissimulation, it forms the predominant feature in their mental constitution ; and, as will afterwards be shewn, it is indicated by a particular form of organization. But, farther, let it be observed, that it is only in so far as the propensities and sentiments of our nature are concerned, that the display of pretended qualities is possible, even in a single case. In regard to every act which depends on the knowing and reflecting faculties, this is absolutely impracticable. No man can either write logical discourses, or trace profoundly an abstract principle, who has not powerful reflecting faculties. No one can compose exquisite music, who has not the faculty of Tune strong ; or write exquisite poetry, who has not a powerful sentiment of Ideality. When, therefore, we perceive, even with the most transient glance, the performance of such acts, we have evidence, insuperable and irresistible, of the existence of the faculties which produce them. trusts the safety of himself and his family? It is to such a friend, as to one who knows and can sympathize with the failings of humanity, that men unfold the secret recesses of their souls. Gall was himself a physician. For these reasons, I venture to conclude that the first point is established in favour of Phrenology-namely, that it is possible, by accurate, patient, and continued observation of actions, to discover the true dispositions and capacities which individuals possess. As this philosophy is founded on a comparison of the manifestations of these faculties with development of the brain, we now proceed to consider the second question-Whether it be possible, in general, to discover the true form of the brain, by observing the figure of the head ? GENERAL REMARKS ON THE BRAIN. The anatomy of the brain is minutely described by Drs Gall and Spurzheim, in their anatomical and physiological work.1 It is not indispensably necessary, although highly advantageous, to become acquainted with it, in order to be a practical phrenologist. A brief description of the general appearance of the brain will suffice to convey an idea of it to the non-medical reader. The proper subjects for observation are healthy individuals not beyond the middle period of life. The brain, stript of its outward covering the dura mater, is represented in Figure 4. and Plates IV. and V. These figures (which are copied from Dr Spurzheim's plates), and the accompanying descriptions, are not intended for anatomical purposes ; their sole object is to convey some conception of the appearance of the brain to readers who have no opportunity of seeing it in nature. 1 Anatomie et Physiologie du Système Nerveux, &c. torn. i. Also Spurzheim's Anatomy of the Brain, &c. London, 1826. 108 GENERAL REMARKS ON THE BRAIN. made, surrounds the brain. The front is at A ; and the line AB is the division between the two halves or hemispheres. Plate IV. represents the base of the brain, as it appears when taken out of the skull ; the forehead being represented uppermost. The brain is a large nervous web, folded up into the forms presented in the drawings. The waving lines represent the convolutions or folds. They vary in depth from half an inch to an inch, in the adult. The hemispheres are formed, previously to birth, from before backwards, and from without inwards. At first, they consist only of a thin membranous layer of nervous matter ; and they increase in thickness and volume very gradually. At birth, the hemispheres are in general three inches and four lines in length, and two inches in breadth. They then present the same form as in the adult, and are covered with convolutions, separated from each other by sulci, furrows, or anfractuosities. tus, it is covered by three membranes, called the pia mater, the arachnoid coat, and the dura mater ; and outside of these by a cartilaginous membrane, destined to be changed into bone. In the seventh or eighth month after conception, points of ossification are formed in this membrane ; these, by the deposition of new osseous particles, extend themselves in the form of rays (like the spiculo of ice when water freezes), until solid bones are formed, the edges of which, dovetailing into each other, constitute the sutures afterwards described. (See Plate III.) In the formation of the skull, the deposition of the osseous particles on the cartilaginous membrane before mentioned, and the fact of this membrane being moulded on the brain, render it a matter of absolute necessity that the skull should be moulded on this organ. The ossification of the skull is not complete before the ninth year. 1 Solly on the Brain, p. 88. 110 GENERAL REMARKS ON THE BRAIN. in the sheep, cat, dog, and ape, and in all the higher classes of animals. Professor Tiedemann, in his work on the Brains of Apes and of some other animals, has accurately delineated and described the progressive diminution and final disappearance of the folds of the brain in the mammalia, from the apes down to the rodentia ; and, according to Desmoulins,1 this progression corresponds exactly with the diminution of intelligence. The most striking difference exists between the apes of the old world and those of the new. Many of the former are capable of being trained and employed for useful purposes, while the latter are incapable of instruction, and scarcely exceed squirrels in the degree of their intelligence. This corresponds with the state of the convolutions. In some dogs, especially those employed in hunting, the convolutions are scarcely less numerous and deep than in the higher tribes of apes ; while in the less intelligent species, and in wolves, they exist in a much inferior degree of development. There is a great difference as to docility between dogs and cats ; and an equally striking difference is found in. the appearances presented by the number and depth of the convolutions of their brains-a difference so great, that Desmoulins estimates the convolutions of the dog to exceed by six or eight times those of the cat. The paucity of convolutions found in the cat prevails throughout the entire genus to which it belongs. That genus, Felis, which includes the cat, lion, tiger, panther, and other animals of a similar nature, is likewise remarkable for the uniformity observed in the number and arrangement of the convolutions in the different species ; and in no genus are the species more distinguished for similarity of disposition, for through none do the faculties of Secretiveness and Destructiveness prevail in so high a degree of strength. The opinion of Drs Gall and Spurzheim, that the convolutions are of great importance in reference to the power of manifesting the mental faculties, is entertained by physiologists in general. It was long since remarked by Soemmering, that, in the earlier months of human existence, there is yet no trace of that complicated and convoluted arrangement of the cerebral surface, which is so striking in the adult brain. According to this eminent anatomist, it is only about the sixth or seventh month of gestation that the convolutions begin to appear. From this period they go on increasing in number and size, with a decreasing rapidity, even to the age of puberty.2 To this progressive growth of the convolutions we have a well-marked counterpart in the gradual development of the mental powers, from the state of almost absolute nullity in which they exist in the fotus during the greater part of its intra-uterine life, to the expanded mind of the adult. 1 Bell's Anatomy, 7th edit. ii. 386. 2 See a notice of the observations of the Wenzels on this subject, in the Phren. Journ. x. 342. 3 Anatomie des Systèmes Nerveux- des Animux Vertebrés, p. 620. 112	GENERAL REMARKS ON THE BRAIN. relation between the extent of surface presented by the brain in each genus, and the amount of intelligence displayed by it. Where differences occur in one of these points, differences are stated to be usually found in the other, not only between different genera, but between different species of the same genus, and also (which is most to our purpose) between different individuals of the same species. Differences of mental character are met with to a much greater extent, and with much greater frequency, among men, than among the individuals of any species of the lower animals. It is rare, for instance, to find one sheep differing much from its companions, or one cow from another, in intelligence and instincts. The brains of men vary with respect to the number and depth of their convolutions, in a far greater degree than those of any other species.1 This fact affords a presumption in favour of the idea that varieties of disposition depend on varieties in the convolutions. It has been remarked, that, in most idiots, the number and depth of the convolutions are less than usual, on at least one side of the brain. In chronic insanity, too, the convolutions are sometimes diminished in depth, and are more or less separated from each other by the thickening and infiltration of the laminse of the pia mater occupying the furrows of the brain. In these cases, likewise, as well as in individuals of congenital imbecility, the thickness of the clneritious substance of the convolutions has been found greatly diminished ; while in acute mania, on the other hand, it has been found of the usual thickness, and highly injected with blood. In old age the convolutions shrink. 1 Vicq d'Azyr, Mém. de Paris, 1783, p. 512 ; cited by Meckel, Anatomie, &c. vol. ii. p. 64C. See also Wenzel, De penitiori Structura Cerebri, p. 23 ; and Mayo's Physioloyy. same time acutely sensible, and capable of expressing himself, complained only of the integument." So far from thinking the parts of the brain which are insensible, to be inferior in function, Sir Charles Bell states that, as every part has its use, he should be led, even by this circumstance, to imagine that they have a higher office-namely, that they are more allied to intellectual operations. The wide difference of function between a part designed to receive such impressions as those belonging to the sense of feeling, and a part which is the seat of thought, is in accordance with the presence of sensibility in some parts of the brain, and its absence in others. The brain receives an unusually large supply of blood, in comparison with the rest of the body. According to Haller, the quantity is one-fifth of the entire amount which leaves the heart ; Monro, however, estimates it at one-tenth, and other authorities at one-eighth. There are no valves in the large veins of the base of the brain and neck, and the brain may be gorged with blood by holding the head lower than the body ; or, after death, drained of it by the erect position. Each side of the brain, and also the cerebellum, are supplied with separate arteries conveying the blood to them ; but the sinuses, or canals by means of which the blood is returned to the heart, are common to them all. The carotid artery on one side, may be tied in man, without injury to the cerebral functions. Even both carotid arteries may be tied, without serious consequences, if an interval of twelve days or upwards be allowed between the operations, to permit the distention of the other arteries. 1 Giddiness in stooping may arise from two causes. If it is felt only when the head u down, there is pressure on the brain from too much blood If it is not felt then, but occurs on raising the head, it is caused by too rapid abstraction of blood from the head. There is then a deficiency of blood in tn6 brain. 114	GENERAL REMARKS ON THE BRAIN. Male, 3 lb. 8. oz. Troy. Female, 3 lb. 4 oz. do. One male brain in 7, exceeds 4 Ib, : one female brain in 100, exceeds 4 lb. Brain, 2 lb. 2 oz.-Cerebellum, 41/3 oz.-total, 2 lb. 6 1/3 oz. ... 2 lb. 8 oz. ... 3 ½ oz. ... 2 lb. 11 ½ oz. ... 2 lb. 5oz. ... 5 oz. ... 2 1b. 10 oz. 1 The post-mortem examination of Cuvier's train took place on the 15th May 1832, in presence of MM. Orfila, Duméril, Dupuytren, Allard, Biett, Valenciennes, Laurillard, Rousseau, Andral neveu, and Bérard. It was ascertained that the superiority of size occurred almost exclusively in the cerebral lobes, particularly their anterior and superior parts ; the cerebellum, &c., exhibiting no unusual development. 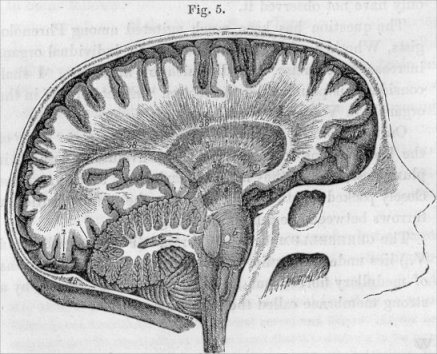 It was stated by M. Bérard to Dr Foissac, the writer whom I follow, that none of the gentlemen present at the dissection remembered to have seen so complicated a brain, convolutions so numerous and compact, or such deep anfractuosities-" un cerveau aussi plissé, des circonvolutions aussi nombreuses et aussi pressées, des anfrac-tuosités si profondes. "-Journal de la Sonétt Phrénologique de Paris, tom, ii. No. v.
ing affirms that it stops in its growth at three years of age, and the brothers Wenzel mention seven. Dr Vimont says between twenty-five and thirty ; and M. Parchappe of Paris, who published on the brain in 1836, agrees with Dr Gall in the opinion that it does not attain its full weight and size till forty. He gives the result of weighing about 250 brains. The Wenzels assigned seven years as the age of complete development, on the authority of two cases only. The reader will judge which authority is most to be relied on.1 I am convinced from observations, that the brain goes on increasing up to 28 or 30 years of age in some individuals, and in the great majority of instances up to 22 or 23. I cannot confirm its spontaneous growth to 40, but I do not deny it. I only have not observed it. The question has been much agitated among Phrenologists, Whether, after maturity of growth, individual organs increase by exercise, and diminish by inactivity. I shall consider this point under the section " Effects of size in the organs," in "Volume II. On the approach of old age, the brain, like other parts of the body, begins to diminish ; the convolutions lose their plumpness, and, as they are now shrivelled, flaccid, and less closely packed together than formerly, the anfractuosities or furrows between them become enlarged. The cerebellum, or " little brain" (F F, Plates IV. and V.,) lies under the brain. It is connected with it by means of medullary fibres ; but its bulk is separated from it by a strong membrane called the tentorium. POPULAR OBSERVATIONS ON THE STRUCTURE OF THE BRAIN. 116	GENERAL REMARKS ON THE BRAIN. immature. The brain is soft and pulpy, and unfit for performing mental operations. Its consistency, however, gradually increases, and its texture becomes more and more firm as the individual approaches to manhood. Plate VI., the arrangement of the two substances, distinguished by their different shading, is well seen. 118 GENERAL REMARKS ON THE BRAIN. of their manifestations. It is undeniable, that no extent of knowledge of mere structure will enable us to predicate particular vital functions ; and hence it is vain to expect that investigations into the structure of the brain will ever reveal its functions without corresponding observations on mental action. Drs Gall and Spurzheim attached much importance to the convolutions, and considered the depth, size, and number of them, to have a great effect on the intensity of the mental manifestations ; but it does not appear that they regarded the cineritious substance as exclusively the organ of the mind. " Dr Gall and I," says Spurzheim, " suppose that each nervous apparatus is composed of two peculiar substances, the pulpy and fibrous, and that both are necessary to produce an instrument adequate to perform a particular function. "x And he is certainly right, for, granting that the gray matter is the special generator of mental power, still, mind could not be manifested without the aid of the conducting white matter, and could not, therefore, be said to exist. 1 Anatomy of the Brain, p. 10.
likened to a cone, of which the apex lies in the medulla oblongata, and the base in the surface of the brain. I introduce this similitude, however, merely as a popular illustration, and not as a technical description of the appearance of the organs ; for they are not separable into definite figures, such as this comparison, if literally understood, would seem to imply. Besides, the structure of the cerebrum is far from being so simple as to permit of such a separation. A moment's reflection will convince any one that something more is necessary for harmonious mental action, than simply the connection of the various mental organs with the physical nervous system. To produce this result, not only must the two hemispheres of the cerebrum stand in intimate relationship to each other, but the different mental organs also must have the means of intercommunication. Accordingly we find that the white matter, or cerebral medulla, constitutes a most complicated apparatus of cross and longitudinal fibres, whereby every part of the brain is brought into intimate reciprocal connection. 1 See Solly On the Brain, Plate x. 120	GENERAL REMARKS ON THE BRAIN. 1 Anatomy, ii. 381. An ingenious paper by Mr Hewett C. Watson, on the probable object of the duplicity of the brain, will be found in The Phrenological Journal, vol. ix. p. 608. See Mr Forster's conjectures, in his Observations on the Influence of the Atmosphere on Health, &c., Section xiv. 2 On the Brain, p. 254.
tions that the posterior division of the auditory nerve, " on crossing the posterior fissure of the cord or fourth ventricle, forms by its separation three or four white lines, which are usually very distinct. Meckel,1 however, states that he has sometimes found the whole of these lines deficient, sometimes on one side and sometimes on both, and that Prochaska and Wenzel have observed them to differ on the two sides of the brain." When, therefore, I mention that slight differences occur between the organs on the two sides of the brain, it will be seen that the brain, in this respect, forms no exception to a general law of the animal economy. 1 Anatomie, tome ii. p. 614, n.
122 GENERAL REMARKS ON THE BRAIN. escapes the unassisted eye, should produce such remarkable differences in function. But the fact that peculiar powers are manifested by extremely minute cells, so small indeed as to require the aid of the microscope for the appreciation of their structure, will cease to be incredible when it is known that whole organisms, possessed of digestive and locomotive systems, exist, of which we are made cognisant only by the use of powerfully magnifying instruments. by which a knowledge of the association of certain mental powers with certain conditions of brain can be obtained. Although, however, no formal lines of demarcation mark the limits of the different organs, the forms of these, as delineated in the bust, are not arbitrary. When any particular organ predominates in size over all those in contact with it, it gives a particular form to the part of the skull which covers it, and the forms thus evolved have been copied in the bust, and on the plates. No one natural head can shew the forms of all the organs distinctly, because they cannot all predominate in one head ; but if a sufficient number be appealed to, complete evidence will be obtained that the forms are not imaginary but natural. Firmness will shew its form in one skull (that of King Robert Bruce, for instance), Conscientiousness in another (Mrs H.J, Benevolence in a third (Jacob Jervis), and so forth. OF THE INTEGUMENTS OF THE BRAIN. 124	GENERAL REMARKS ON THE BRAIN. skull. It embraces the outer surface of the brain above the membrane last mentioned. When in health, it does not possess sensibility, and has been pricked without causing pain. The brain, enclosed in these membranes, fills exactly the interior of the skull ; so that a cast, in plaster, of the interior of the skull, is a facsimile of the brain, covered by the dura mater. Between the two layers of the arachnoid membrane a small quantity of fluid generally exists, but in the state of health it never exceeds a line in thickness. Accordingly this fluid does not, in any degree that can be distinguished by the hand or eye, cause the form of the interior of the skull to differ from the form of the exterior of the brain. In cases of cerebral disease, however, and in old age, the brain occasionally undergoes diminution from absorption ; when the place of the absorbed matter may be occupied either by increased effusion from the arachnoid membrane, or by increased thickness of the walls of the skull, which also occasionally shrinks to accommodate itself to the brain when its size diminishes. The skull, then, is not an adamantine barrier confining the brain within specific boundaries ; but a strong yet changeable covering, shielding it, and accommodating itself to its size while in the progress of its growth.1 At birth it is small ; it increases as the brain increases, and alters its shape with every change of the cerebral form; it stops in development when the brain has attained its full size ; and, as we have just remarked, it is apt to diminish when this organ suffers diminution, through disease or old age. A process of absorption and deposition goes continually on in its substance ; so that, if the brain presses from within, the renovating particles arrange themselves according to this pressure, and thus the figure of the skull and that of the brain in general correspond. In cases of water in the head, the skull sometimes extends itself to an enormous size. 1 On the admirable fitness of the skull to protect the brain, see The Phrenological Journal, viii. 332. The skull is composed of nine bones. (See Plate III. and description of it.) These are-two frontal bones E, which compose the forehead, and generally soon unite into one, though in some adults they continue double; two parietal bones D, forming the greater part of the upper and lateral regions of the skull ; two temporal B, around the ears; one sphenoid A, iv-the anterior part of the basilar region; one occipital G, in the back and under part of the skull, immediately above the neck ; and one ethmoidal, at the base behind the nose. The lines of junction of these bones are termed sutures SSS, and form, in most parts, a sort of dovetailing. The principal sutures are the sagittal, separating the two parietal bones at the middle of the top of the head ; the coronal, which divides the frontal from the parietal bones ; the lambdoidal, between the occipital bone and the two parietals, and deriving its name from its resemblance to the Greek letter lambda (a) ; the frontal, dividing the two frontal bones when they are not conjoined ; and the temporal, named also the squamous from its scaly appearance, dividing the temporal bones from the parietal, and to some extent from the sphenoid and occipital. supplied with bloodvessels ; and a large portion of the blood returning from the brain to the heart, goes up these vessels into a canal formed by the membrane all along the line of its attachment to the skull. The course of the blood through the canal is from the front backwards, and then downwards. The two hemispheres of the brain are completely separated, as far as this membrane is seen to extend downwards in the cut. At the lower edge of it, an open space appears ;-the commissure, or collection of fibres which unite the two sides, named the 'corpus callosum, goes through that space. The cerebellum lies at B C, in a part of the skull not opened. The membrane, on reaching the point C, spreads out to the right and left, and runs forward, so as to separate the cerebellum from the brain ; the latter lying above, and the former below it. B is the mastoid process, or bone to which the sterno-mastoid muscle is attached. It lies immediately behind the opening of the ear, and is not connected with the brain. 1 See Dr Caldwell on the parallelism of the tables, Phren. Jour. ix. 222. 2 " Jamais je u' ai prétendu distinguer des modifications peu prononcées des formes du crâne, ou de légères nuances du caractère. ''-Gall, iii. 41. The integuments which cover the skull on the outside, indisputably lie close upon its surface, and are so uniform in their thickness, as to exhibit, with sufficient accuracy, its true figure. The temples and occiput are the only parts where the integuments are thicker than at the others, and the phrenologist attends to this fact in making his observations. Thus there is no obstacle in general to the discovery of the figure of the brain, by observations on the form of the skull or head. 1 Tome iii. p. 43. 2 Vol i. p. 285. 3 " A comparison of the external and internal surfaces of the cranium establishes the fact, that there is a general correspondence of the two, as far as regards those parts which are in contact with the periphery of the brain. But, between the several divisions of that organ, there are developed on the inside of the skull very large ribs and processes which destroy the particular correspondence of the two surfaces. Nevertheless, this does not impair our ability to deduce the internal capacity of the cranium from an examination of its exterior ; since the diploë between the two plates in the spaces intermediate to these ribs, seldom varies more than one or two lines in its thickness." - Cyclopodia of Anatomy and Physiology, edited by Professor Todd ; Article Cranium. * Anatomie Comparative, ii. 13. 128 OF THE INTEGUMENTS OF THE BRAIN. 1 Milligan's Translation, p. 104. 2 Bell's Anatomy, ii. 390. Sir C. Bell adds in a foot-note, " Certainly the skull is adapted to the form of the brain ; but there is a deeper question, which our craniologists have forgotten,- Is the brain constituted in shape with a reference to the future form of the head ?" It is difficult to see the importance of this question. Not only is the skull, at every period before the decline of life, adapted to the form of the brain, but it increases in size when the brain enlarges, and decreases when the brain diminishes. The reader will find an answer to Sir Charles Bell's objections in The Phrenological Journal, viii. 333.
a common trick with the opponents of Phrenology to collect these thickened skulls, and to represent them as average specimens of healthy crania, under the middle period of life ; but this is pure deception, practised on that portion of the public which is unacquainted with anatomy. There are parts at the base of the brain, in the middle and posterior regions, the size of which cannot be discovered during life, and whose functions in consequence are still unknown. From analogy, and from some pathological facts, they are supposed to be the organs of the love of life, and of some other mental affections for which cerebral organs have not been discovered ; but demonstrative evidence to this effect being wanting, the conjecture is stated merely to incite to farther investigation. isolation from the full broad swell of cerebral development. In anatomy, projecting bony points are called processes. The mastoid process of the temporal bone (B in figure, p. 125), which is a small knob immediately behind the ear, serving for the attachment of a muscle, is sometimes mistaken for the indication of large Combativeness. It is, however, merely a bony prominence, which is found in every head, and does not indicate development of brain at all. Another process, called by anatomists the spinous process of the transverse ridge of the occipital bone, requires to be known. Phrenologists generally name it shortly the occipital spine, and its situation is indicated by C in the figure, p. 125. There is one part of the skull where the external configuration does not always indicate exactly the size of the subjacent parts of the brain, and upon which objections have been raised. At the part of the frontal bone immediately above the top of the nose, a divergence from parallelism is sometimes produced by the existence of a small cavity called the frontal sinus. cover. "1 Its size in one individual is shewn in the cut ; it is sometimes larger and sometimes smaller than that here represented. It is formed between the two tables of the bone, either by the external table swelling out a little without being followed by the internal, and presenting an appearance like that of a blister on a biscuit, or by the internal table sinking in without being followed by the external. It has been argued by some individuals, that the existence of a frontal sinus is an insuperable objection to Phrenology in general, because it throws so much uncertainty in the way of our observations as completely to destroy their value. Other opponents, however, more rationally confine their objection to those organs over which the sinus extends. The first objection is manifestly untenable. Even granting the sinus to be an insuperable obstacle in the way of ascertaining the development of the organs over which it is situated, it is plain that, in ordinary cases, it interferes with only a few, namely, Form, Size, Weight, Individuality, and Locality ; and that the whole external appearances of the other thirty or thirty-one organs are left as unaltered as if no frontal sinus existed. It would be quite as logical to speak of a snow-storm in Norway obstructing the highway from Edinburgh to London, as of a small sinus at the top of the nose concealing the development of Benevolence, Firmness, or Veneration, on the crown of the head. 1 Dictionnaire de Médecine, ix. 504.
thirdly, in old age. and in diseases such as idiocy and chronic insanity, it is often of very great extent, owing to the brain diminishing in size, and the inner table of the skull following it, while the outer remains stationary. The first cases present no objection, for in them the sinus does not exist so high as to interfere with the observation of the size of the organs ; the third are instances of disease, which are uniformly excluded in phrenological observations ; and thus our attention is limited solely to the cases forming the second class. In regard to them the objection is, that large development of brain, and large frontal sinus, present so nearly the same appearance that we cannot accurately distinguish them, and that therefore our observations must be inconclusive. and in disease. In sawing open the skull for anatomical purposes, the section is almost always made horizontally through the middle of the forehead, or over the organs of Tune, Time, and Eventuality ; in all the cases alluded to by the gentleman in Paris, this line was followed, and as the sinus rarely extends so high up, he could not, and did not, meet with it. On examining vertical sections, however, for the purpose of seeing the sinus, he has since frequently found it to the extent mentioned in the text. 134	ANATOMY OF THE BRAIN. of organs. In the former case, the elevations are usually more abrupt and ridgy ; and in the latter, they present a rounder swell, and follow the direction of the organs as delineated on the busts. If, then, men in general manifest their natural qualities in their actions ; and if, in healthy individuals, not beyond the middle period of life, the form of the brain may be discovered by observing the figure of the head ; it follows that the true faculties, and the true cerebral development, may be compared in living subjects : and on these grounds the proposition is established, that the phrenological mode of philosophising is competent to enable us to attain the results sought for. Before proceeding to the practical application of the principles of Phrenology, I subjoin a few remarks on the anatomy of the brain, principally taken from those which Dr Fossati has added to his French translation of my Elements of Phrenology.